A 70-year collection of documents sits in a climate controlled beehive of a room in the basement of Porsche's Weissach Development Center. The windowless room is created so that the fragile documents aren't harmed by natural light. The hexagonal stacks of document roll tubes provide structure to ensure the papers aren't weighing down on each other or creasing. There are drawings in this room that date back to the dawn of Porsche, including the tech drawing for the steering wheel of the Cisitalia project, which was later re-used on the 356-001 project. While most of Porsche's history is retained in the archives at the Porsche Museum, which opened in early 2009. 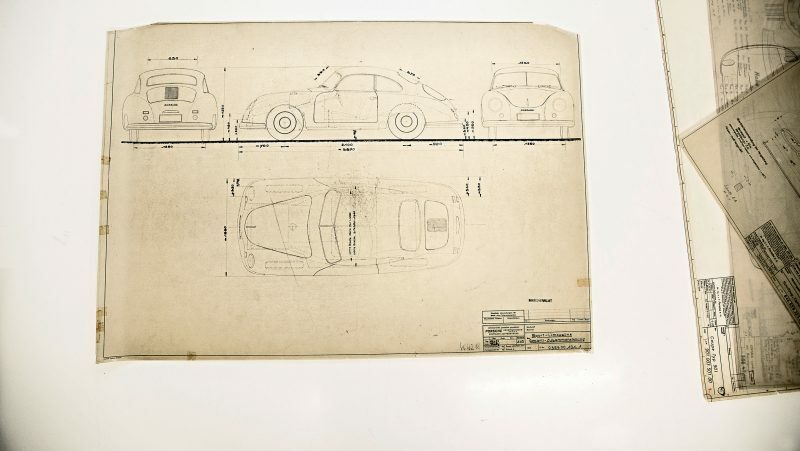 Those archives hold many of the cars Kardex build sheet cards and documents pertaining to the creation and running of the company. These documents found here are more deeply entrenched in Porsche past. They're the nerdy deep dive into the individual components that most Porsche fans wouldn't care to take. For folks like you and I, who get excited about minute details, the ones that make Porsche feel special, this archive exists. Back in 1952, the original Carrera script was hand-drawn and given dimensions. That document is among the stacks. This is my kind of place! As caretaker of the document cache, Uwe Geisel has a serious reverence for the history of Porsche. He tends to the vintage paper with care and caution. These are original drawings. They were sketched out on an engineer's drafting table all those years ago. They still have the original markings from that original designer. Technical aspects that were all done by hand remain intact. There are dimensions, relational distances, and measures that had to be checked and re-checked before they were put to paper. No computers, of course, this was all done from the hands and minds of humans. Astonishing, when you think about how far Porsche has come in those 70 short years. They should all be digitally and carefully scanned…..to create a backup database of electronic “originals”, that will better stand the test of time when paper ultimately cracks and crumbles. Of course digital storage has its own risks but can be managed too. Wil is absolutely correct. I know of several instances where irreplaceable original racing photographs and historically-important documents have been destroyed because of unforeseen weather events that flooded or otherwise damaged what were thought to be safe storage locations. If anyone possesses such items, please copy them digitally and store them in a separate safe location.